(Nanowerk News) It is very difficult to predict whether a cancer drug will help an individual patient: only around one third of drugs will work directly in a given patient. Researchers at the Heinz Nixdorf Chair for Medical Electronics at the Technische Universitaet Muenchen (TUM) have developed a new test process for cancer drugs. With the help of microchips, they can establish in the laboratory whether a patient's tumor cells will react to a given drug. This chip could help in future with the rapid identification of the most effective medication for the individual patient. Cancer is the second most common cause of death in the Western world. According to the German Cancer Research Center in Heidelberg, approximately 450,000 people develop cancer every year in Germany. Although the doctors who treat cancer have numerous cancer drugs at their disposal today, the treatment must be precisely tailored to the patient and the type of cancer in question to be as effective as possible. If it takes a second or third try to find a drug that works, the patient loses valuable time in which the tumor can continue to grow. Sensor biochips like this one, developed at the Technische Universitaet Muenchen, could be used to establish in the laboratory whether or not a particular cancer drug is likely to work in an individual patient's body. 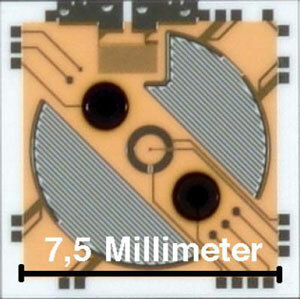 Shown here is a ceramic version of the chip -- just a few millimeters across but packed with sensors. In the future, miniature laboratories could provide the fast help required here. A lab-on-a-chip is a device -- made of glass, for example -- that is just a few millimeters across and has bioelectronic sensors that monitor the vitality of living cells. The chips sit in small wells, known as microtiter plates, and are covered with a patient's tumor cells. A robot changes the culture fluid in each well containing a chip at intervals of just a few minutes. The microsensors on the chip record, among other things, changes in the acid content of the medium and the cells' oxygen consumption; photographs of the process are also taken by a microscope fitted underneath the microtiter plate. All of the data merge in a computer that is connected to the system, and which provides an overview of the metabolic activity of the tumor cells and their vitality. The robots and microtiter plates are kept in a chamber which, through precisely regulated temperature and humidity, provides an environment similar to that of the human body, and which also protects the tumor cells against external influences that can falsify the test results. After the tumor cells have been able to divide undisturbed for a few hours, the robot applies an anti-cancer substance. If their metabolic activity declines over the next day or two, the active substance was able to kill the tumor cells and the drug is effective. Using the microchips, twenty-four active substances or combinations of active substances can be tested simultaneously in this way. The gain in time for the patient is not the only positive factor here. Dr. Helmut Grothe, a scientist from the Heinz Nixdorf Chair at the TUM, explains: "Treatment with an ineffective cancer drug sometimes leads to the development of resistance to other drugs in the patient." Such resistance on the part of the tumor cells can also be identified at an early stage with the help of the sensor chip. Another advantage of the system is its automation. The robot works faster and more accurately than any human could. Hence, the test results can be obtained quickly, which, in turn, saves on costs. Furthermore, the possibility of testing tumor cells with several active substances simultaneously facilitates the search for effective substances for individually tailored cancer treatment. Pharmaceutical companies may also be able to use the sensor chip in the development of new drugs in future. As part of another research project, the scientists at the Heinz Nixdorf Chair are also developing a sensor chip that is intended to control tumor growth. The chip, which would be implanted once in the vicinity of the tumor, could release cancer drugs or pain medication only when the tumor grows. The release of the active substances would be controlled by electrical impulses. This sensor system could be used in the treatment of inoperable tumors, for example pancreatic tumors. In the past, microchips have also been developed at the TUM's Heinz Nixdorf Chair for use in other research fields. For example, one such system is used in the analysis of the water quality of streams and rivers. In this case, a small pump removes samples at regular intervals from the water body and channels it via a pipe to a sensor chip on which algae have been planted. As algae are highly sensitive to toxic substances, they are particularly suitable for water analysis and react to the minutest impurities: their metabolic activity, which is measured on the basis of their oxygen production, declines in less than one minute in the presence of toxins. The data recorded by this sensor system are transmitted via mobile telephone to a computer that raises the alarm. The TUM research team won the E.ON Environmental Award, presented by the Bavarian energy company of the same name, for this system in 2008.